I have (ok, I had) a drawer in my craft room that I used to store miscellaneous ribbons for crafts and scrapbooking projects. Now I have a much more organized solution. I was browsing through Target today and found some gift wrapping ribbon storage containers for under $3.00 each. I decided that this was exactly what I needed to organize my extra craft ribbon, and ultimately reclaim the space in that drawer for other things. They are Snapware Snap ‘N Stack. I love that they were cheap. This is a good time to look for these. Now that Christmas is over the stores are trying to get rid of them. However, you can get them at any time of year online. You can purchase the Seasonal Snap ‘N Stack directly from Snapware or on Amazon. 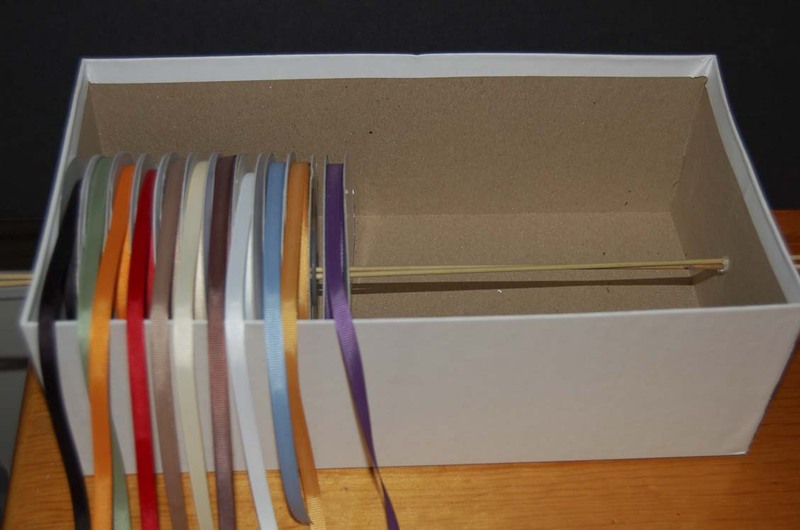 If you want to make your own ribbon organizer box, you can use a shoebox and small wooden dowel.